Use your smartphone as a remote control for your Echo devices? Yes, you can! Amazon's Alexa-enabled devices such as the Echo line of products are controlled by your voice, reacting to commands whenever they hear the name 'Alexa' (or another moniker if you've customized yours). Although these popular gadgets tend to hear even the most soft-spoken person in the room, there is a limit to how far away you can be before it stops acknowledging your speech. In cases where your Echo can't hear you, you often can access Alexa on your Android or iOS smartphone, and 'speak' to your Echo even when you're not anywhere near home. This is referred to as using your smartphone as an Echo remote or controlling your Echo remotely. When out of voice range with your Alexa devices, you can use the Alexa app on your phone to voice control your smart home devices. It's not the same as speaking directly to your device, of course, but you can speak into your phone using the app to verbally send a variety of commands to your Echo. This process can come in handy when you've integrated Alexa with your smart home and would like to control your lights, start up some music, remotely control other appliances, or just want to access one of the many useful features while in another room or even in another town. You simply speak commands into your phone to send them to your Echo and ask it to perform specific actions using the voice feature of the app. You don't need a wake word, because you wake Alexa using the app. That, in turn, puts all connected Echo devices on alert. Then you just give the command, such as: "Play Queen on the Office Dot" or "Turn on kitchen lights." Some people call this method controlling your Echo while others refer to it as using an Alexa remote or an Echo remote. That's because the terms Alexa and Echo are becoming intertwined as people use the two products more and more. However, it's important to remember there is a difference: Alexa is a voice assistant while Echo is a physical device. To further complicate the matter, Alexa can be used on products that are NOT Echo devices, such as stoves or speakers from companies that are not Amazon. There are some things you simply can't control on your Echo device using your voice and the Alexa app. For example, you can't set a timer or an alarm on a specific Echo device using the voice features of the app. Certain skills also can't be directed to specific Echo devices. The key here is to play around with different commands, skills, and options in order to determine what Alexa and Echo can currently do together. 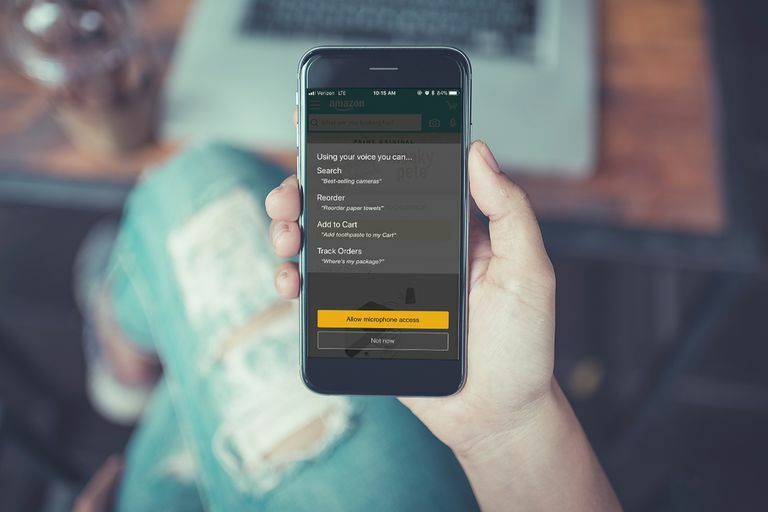 Amazon is continually adding new features to both the app and the devices so something that can't be done today might well be easy to do tomorrow. Take the following steps to control Amazon Echo from your iPhone or Android device. If it's not already on your phone, download and install the Amazon Alexa app. It's the same app which you used to set up your Echo device initially. Tap the microphone icon represented by a blue circle in the middle of the toolbar at the bottom of your screen. Select the ALLOW button to grant the Alexa app access to your device's microphone, if prompted. You might also be prompted to try Alexa. Just follow the on-screen instructions to continue; this prompt won't occur in the future. Once Alexa is ready to hear your command or question, the screen will become darker and a pulsating blue line will appear at the bottom of your screen. You'll also see a sample text prompt, such as Just ask, "Alexa, order dog food". Simply speak into your smartphone at this point as if you were talking to your Echo device. Did you know you can open the Alexa app and go to the Devices tab (it looks like a little house with toggle switches on the front) to use your smartphone to control any connected device remotely?